These are some of the items received from a Delaware delegation’s April visit to Sakata, Japan. 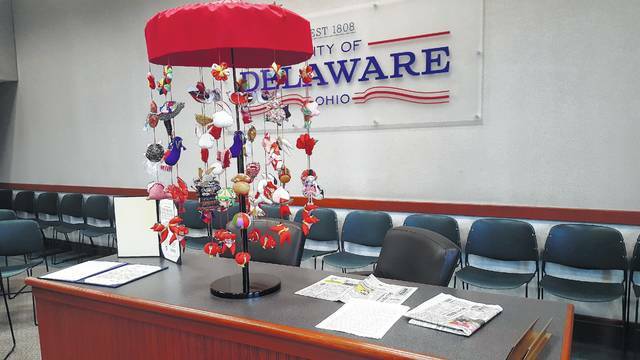 Delaware has sister city relationships with Baumholder, Germany and Sakata. Delaware City Manager R. Thomas Homan describes his vision of adding a display of sister city-related items on the first floor of City Hall with City Council’s blessing. The Sandusky Street entrance would be open during special events to allow the public to see the items. 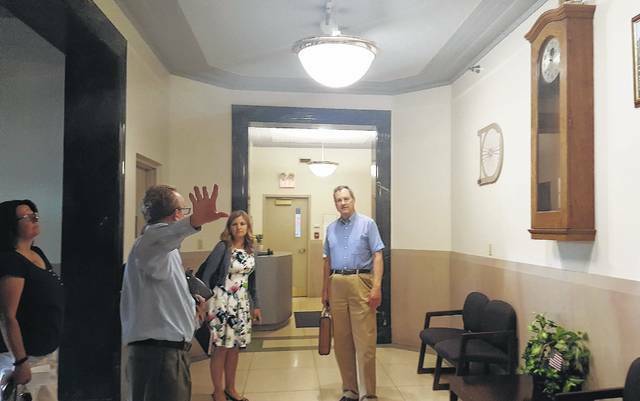 Delaware City Manager R. Thomas Homan would like to use a space on the first floor of City Hall as an exhbit area. With the blessing of City Council, Homan plans to create a display with items received from sister city trips to Baumholder, Germany, and, more recently, Sakata, Japan. “This space could be set aside,” Homan said at a Sister City Advisory Board meeting Tuesday evening. The “space is hardly used,” he added. The first floor’s accessibility to the public is the main challenge, Homan said. The William Street entrance is accessible only for city staff, while the Sandusky Street entrance, which leads directly to the first floor, is locked. City Hall visitors can only use the south entrance because of the city’s security protocols. But Homan envisions that the Sandusky Street doors could be open during special events such as First Friday to allow people to visit the display. It could feature temporary and permanent items from sister cities, Homan said. The wall where the display could be located now has a few pieces of artwork and a grandfather clock. He wasn’t sure if the clock was connected the original city hall, which was destroyed by a fire in 1934. Three years later, the current City Hall opened in the same location. “I think it’s a great idea,” said resident Tom Wolber, who attended the meeting. During the meeting, Homan and Mayor Carolyn Kay Riggle provided the board with a report of their April activities in Sakata. The delegation included representatives from Delaware City Schools and Ohio Wesleyan University. They learned more about Sakata’s culture, businesses, and government. A formal sister city relationship was eastblished during the visit. Homan said he would like to utilize the board to make the relationship sustainable for years to come. • discussed a visit to Baumholder next year for the dedication of a museum about the history of the American military post’s impact on the city. The post was a training ground for American troops going back to the Korean War, said Rand Guebert, chairman of the board. Guebert said he knows of about five local veterans interested in visiting the city. • briefly discussed about a potential visit to Omutninsk in Russia.